The ruins of Whitby Abbey on the cliff face the North Sea in the northeast of the North York Moors. Driving along the A171 towards Whitby and approaching it, I could see balck silhouettes having strange shapes against the sea. They were the ruins of Whitby Abbey, one of the most dramatic ruins in England. The beautiful columns and arches of arcades, triforiums and clerestories can be seen here too. The present ruined abbey was built from the 13th to the 15th century. The abbey has a very old history dating back to the days of the Heptachy. To the south of Northumbria, there was the kingdom of Mercia, ruled by King Penda, a pagan and a powerful king. Two kings of Northumbria, Edwin and Oswald, were killed in succession in battles by him. Then Oswy, a young brother of Oswald and King of Northumbria, prayed God for victory in the battle against Penda, vowing to build abbeys after defeating him. In 655, Oswy won the Battle of River Winwead, near Leeds, against Penda. He built 12 abbeys in his kingdom in 657. One of them was the first abbey built at Whitby. But it was destroyed by the Danes in 867. 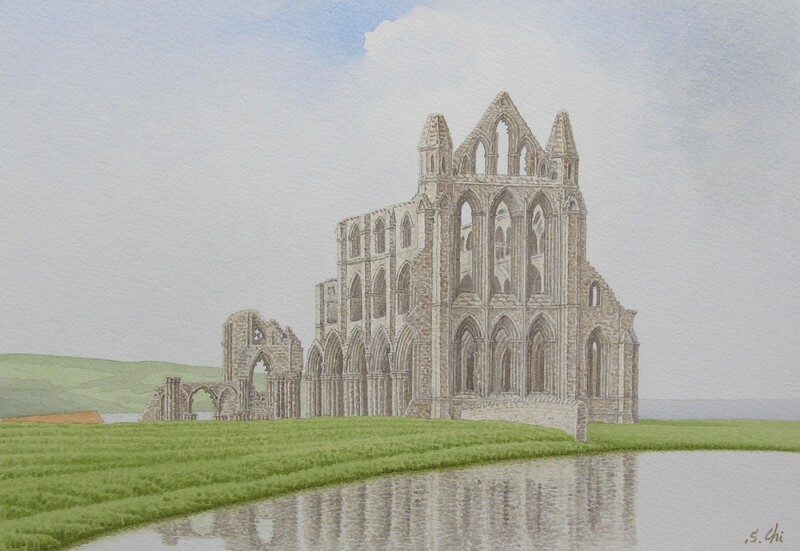 The construction of the abbey which we can see today started in about 1220. As the construction was interrupted many times, it was the 15th century when the abbwy was finally completed. It was in 1539 when this abbey was dissolved, leading to its ruination. The Synod of Whitby was held in 664. The Christianity of England was settled to be the Roman Catholicism which was spread newly by St Augustine, by the decision of King Oswy. Up to that time, there had been two Christian Churches in England, the Roman and the Celtic Church. As the latter, which had continued from the Roman age, had been cut off from Rome for a long time, it had been changed by Celtic elements. During the 12th and the 13th century when the activities of monasteries flourished, many abbeys and priories were built in England. In the 14th century when the Black Death spread, these activities were declined, though it is said there were almost 1000 ecclesiastical houses in England and Wales. Then many of them disappeared under the Dissolutions of the Monasteries of Henry VIII. Now only a little more than 200 remain in ruins. It is said there were 134 monasteries in Yorkshire, but the ruins of less than 20 of them remain today.